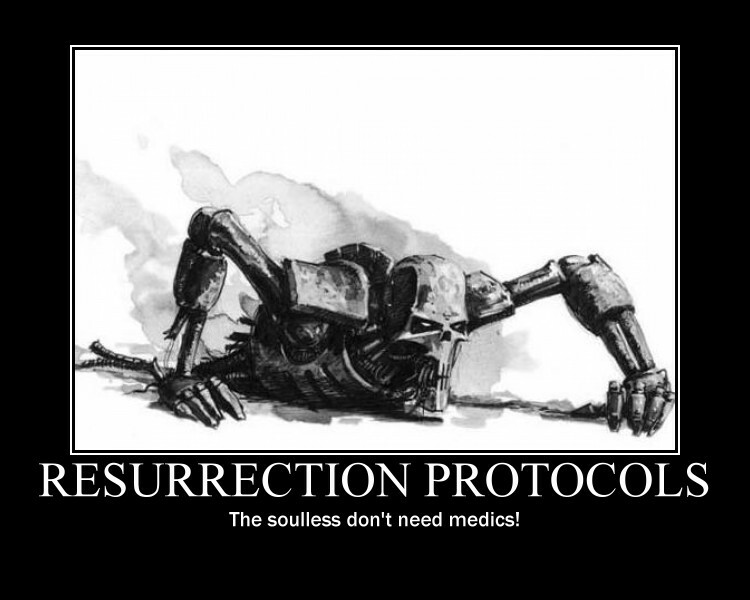 I'm afraid I'm going to need some Resurrection Protocols myself as I haven't had a chance to post up the next part of the codex review due to a ton of work and study deadlines. Fear not, the remaining two posts will go online this friday instead! Slightly off topic, those who have been enjoying Killzone had better keep an eye on Galaxy in Flames. James and Brian have been working hard to update the fun skirmish Killzone rules and if all goes well the newest version should be online this coming friday as well. I for one am rather excited to see what little tweaks they've implemented, as well as the FAQs for the Grey Knights, Sisters of Battle and Necrons. Heck, looks like I may be able to do something cool afterall with that Lychguard / Praetorian box I bought myself! And while we're on the topic of Killzone, I've been piecing together some old, random bits to make some equally random minis that I'm certain will find their way into a future Killzone team. First up we have a rather tall, alien mercenary I'll also be painting up as a count as Telion for a contest on Astronomican. The body is a Reaper Intergalactic Ranger (link), while several 40K bits have been added here and there. Unfortunately I have no idea where the head is from, both itself and the body it came with were a gift from a friend years ago and had no company symbol or marking on them anywhere. Secondly there is this rather slithery fellow, build using a GW necromancer, FW Tallarn sniper rifle, a very, very old snakeman head (unknown manufacteror), some Green Stuff and various little bits and bobs. And that does it for today, good luck with the rest of the week people and until friday!